Craft brewing has got to be one of the top tourism draws in Denver, and if it isn’t, it should be. Besides hosting the Great American Beer Festival in October, Denver has become a hotbed of brewing activity with some very small to pretty large scale craft breweries producing some really good and adventurous beers. 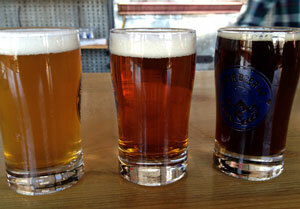 On my recent trip to the Mile High City I sampled six craft breweries for you. Yes that’s right I did it so I could write this blog post just for you. With it’s first base of operations in the ski resort town of Breckenridge, CO, Breckenridge Brewery now produces much of its beer in Denver and has several tasting rooms. I actually went to the restaurant location in Breckenridge for lunch and had a pint. I had an Avalanche Ale, their amber ale. I must admit I don’t have any tasting notes, since I had just come from the local craft distillery in Breckenridge and I was off to a great start that morning tasting bourbon, rum, and vodka. Lunch was excellent, though, with gourmet pub grub. The duck bratwurst was fan-freakin-tastic. And oh by the way, they server tater tots as a side dish! 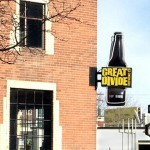 Breckenridge beers are pretty widely distributed around the USA so you should be able to sample some near you. I opted for tasters since every craft brewhouse offered tasting size glasses of everything they had on tap. This was great for me since I wanted to sample a few different styles from each brewery but also be able to stand at the end of the day. Remember, if you are not used to higher altitude, the alcohol will catch up with you a lot sooner. Drinking a ton of pints just ends up bloating me to an uncomfortable and grumpy state of mind anyway. 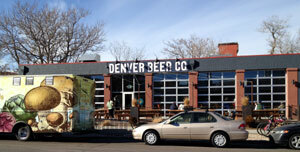 Enough about the inner workings of my gut, lets talk about Denver Beer Co. 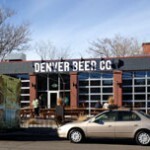 Located on the edge of downtown, this brewery is close to the REI flagship store, and some of Denver’s tourist attractions like Elitch Gardens amusement park and the Denver Aquarium. Since they don’t serve food, a gourmet food truck will usually be parked outside serving up something to pair with your selection. The roll up doors were closed since it was January, but come summer time it will be the cool and breezy place to be. People were riding their bikes here and some well behaved dogs were welcome patrons indoors along with their people. The beers here are brewed in small batches and the recipes seem pretty adventurous. Their lineup is always changing which would make the “frequent drinker” program great if you were a local or traveled here a lot. My favorite was their Rauchbier. It’s a smoky German lager that you don’t see very often. Theirs had a subtle smoke flavor that didn’t overpower the maltiness. Next up is Great Divide . Although they are pretty widley distributed they started small, right here in Denver. Their brewery tour was one of the best I’ve been on because they led small groups out onto the floor while brewing was taking place. We wandered among the fermenting tanks stepping over hoses and sloshing through a little bit of stale beer on the floor. Plus we got to take our beers along on the tour, which was a plus. The tasting room was busy, busy, busy and my favorite taste was the Espresso Oak Stout. It had a yummy coffee start with the oak-barrel finish all wrapped up in a sticky, foamy roasted malt stout. When you are there be sure to check out the big outdoor fermenting tanks. All of their production comes right from here. River North Brewery had the smallest tasting room, but maybe the largest brewing floor visible behind the glass windows behind the bar. Looking down on a huge old factory space, it was stacked with bags of malted grain and towering mash tuns. Their beers were Belgian style or Belgian influenced and all had interesting names which became harder to pronounce without slurring as time went on. Come on, you try saying Hoppenberg Uncertainty Principle when you’re not sober. I had to declare a tie between two of my favorites here. I had the J. Marie Saison with it’s slightly fruity belgian farmhouse tanginess and something called Hello Darkness, a black IPA. Dark, dry and hoppy on the nose and tastebuds. The last round before dinner was at Our Mutual Friend Malt & Brew. This place specializes in session-able beers, lower in alcohol but easy drinking so that you can enjoy a couple rounds with friends. With Cracker Jacks behind the counter, board and card games stacked in the corner, and an honest to goodness turntable spinning the tunes, this place had a definite hipster ambiance that did charm me into wanting to stick around later in the evening. I ended up with a pint here of their Brown Ale. It was as advertised, tasty, and easy drinking. The last little stop on my tour was Brewery Rickoli’s just outside Denver city limits in Wheat Ridge, CO. A little of the downtown vibe is lost here, but what they lose in location they make up for in variety. They had a mind boggling number of different craft brews and styles that they cooked up in-house. There are ten beers listed on their website, but there were definitely more than that on the little mat they laid out in front of us and then topped with tasting glasses. Picking a favorite here wasn’t practical, or within the power of my memory at this point in the night. We did share the tasting flight between three people and I’m glad none of use were sick with a cold or the flu. We happily swapped glasses around and had a grand ol’ time tasting the likes of “Meh’ Cream Ale” and “Rickoli’s Rye Stout.” Actually, I do remember a favorite, the “Social Lubricant Scotch Ale.” It was a nice malty finish to the night. So there you have it, six craft breweries to give you the flavor of Colorado beer. There are even more breweries in Denver, and I didn’t get to hit them all, so if you have any favorites that I missed please let me know.